With wedding season in full bloom, we thought it'd be fun to look at the top bridal trends that stepped off the runway at Bridal Fashion Week. Our showroom houses a large variety of fashion-forward, preowned and sample dresses that are on trend and approachable. From statement sleeves to colored details, we're going to round up our favorite looks and what type of bride they'd be perfect for. Billowing shapes and elaborate trimming can make for a wonderful addition to a classic or simple dress. We love a good sleeve to add a little flair to any dress, look or event type. From Alexandra Grecco and Rue De Seine, the runways were swarming with detailed cuffs, balloon silhouettes and embellished sleeves. We've been noticing a lot of dresses with colored detailing on them. Some brides are steering away from traditional block-hued dresses and moving towards gowns with hints of color here and there. 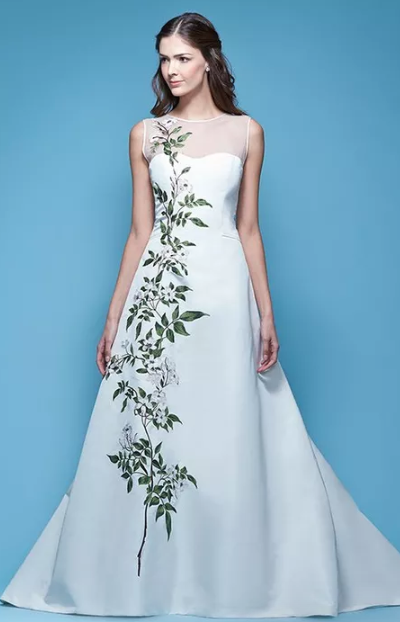 Whether it's a full-on pastel dress like the below by Monique Lhuillier or some embroidery like on this Carolina Herrera dress, we are loving the idea of wearing an accent color on a dress! Ever since the Duke and Duchess of Sussex got married, designers have been taking their inspiration from Clare Waight Keller's masterpiece of minimalistic bridal fair. Long, clean lines, simple silhouettes and no-see thread work has been a growing trend among brides-to-be. We have a few chic pieces from Alexandra Grecco and Vera Wang for the bride who wants to take an understated approach. One of our personal favorites is bows, bows, bows! This year, the bow takes an elevated take and appears in a very editorial way. This is an ideal trend for the bride who wants a modern interpretation of the ‘girly vibe’. From Oscar de la Renta to Sareh Nouri Naomi, we have a variety of dresses with understated and oversized bow detail. Discover trend-led pieces in our Manhattan showroom. Book an appointment below, you never know what you may find.